Cook Spaghetti Noodles per package. Steam the Frozen Vegetables—we got the ones that you steam in the bag in the microwave. Add peanut oil to a wok over medium-high heat and allow it to heat up. Add the Gardein Beefless Tips; cook until they’re brown and crispy on the edges. Remove from wok; keep warm. Leave the leftover Peanut Oil in the wok for increased yumminess in the next step. In the same wok, mix Vegetable Broth, Stir-Fry Sauce, and Marmalade. Whisk the Marmalade in until it dissipates. Heat until boiling, adding the Cayanne Pepper right before boiling. Stir in the (no longer) Frozen Vegetables, Baby Corn, Spaghetti Noodles. Reduce heat to medium. Cook until the sauce boils, and then simmer for about 5 minutes. If you use the teriyaki glaze instead of the stir-fry sauce like I think you should, your sauce might not boil; in that case just cook about 10 minutes. 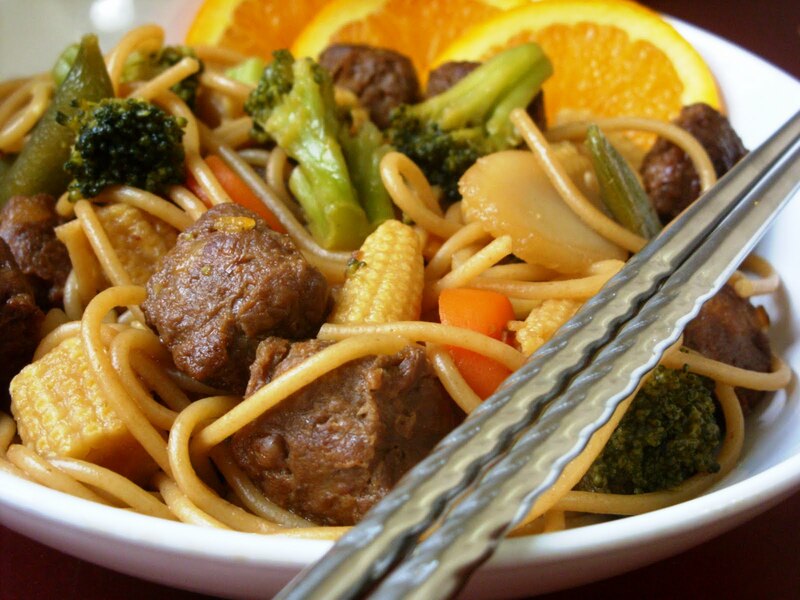 Stir in beef. Cook a couple of extra minutes. Serve. Eat. Wrestle. this is a brilliant analogy, and i am gonna use it every time my veganer-than-thou friends give me guff about eating fake meat. great-looking recipe, too! beefless tips rule! Brilliant post and delicious looking food..! Only you could make a pro-wrestling / veganism analogy, love it! How do you measure 1 1/2 cups spaghetti noodles?